The year 2009 would go down in Tollywood annals as a mixed one. The year did begin on a high with a hit film in the very first month, but as it inches to a close, December releases have gone awry, shootings are stalled and film screenings stopped, no thanks to the ongoing Telangana tussle. Of the 125 theatrical releases, only six were declared hits by the trade guides, pushing producers, distributors and exhibitors in the middle of a major financial mess (losses to the tune of Rs 300 crore were incurred on Telugu films and 120 theatres shut shop). Though Telugu filmmakers did their bit to woo the audience with varied genres — suspense thrillers (Kavya’s Diary, Amaravathi and Katha), horror movies (Diary and Aa Intlo) romances (Boni and Kurradu), family dramas (Mithrudu and Bangaru Babu) and even small concept movies (Villagelo Vinayakudu, Indhumathi), the audience didn’t seem to like any of them. Amidst a heap of flops, the brightest spot was Magadheera starring Ram Charan Tej and Kajal Agarwal. The film became the highest Tollywood grosser ever made (Rs 57 crore and counting). There are now reports that the film is being remade in Hindi even as leading production houses fight over the film’s original rights. Anushka and Sonu Sood’s Arundhati made Rs 30 crore and was the first hit of the year. Ravi Teja scored a hit with Kick (it earned over Rs 22 crore). About 40 small-budget films hit the screens. And surprise, surprise! Some of them went on to be money-minting projects too. While Prayanam (Rs 5 crore) and Ride (Rs 8 crore) were hits, Bendu Apparao also made money (Rs 9 crore). “The audience thumbed down clichéd masala flicks. Novelty is the key,” says filmmaker M S Raju whose Maska didn’t work at the BO. This seems to be Hollywood’s big year in AP. While the Telugu version of Hollywood blockbusters 2012 (earned Rs 30 crore) and Avatar were huge successes, even other dubbed flicks like Twilight, The Twilight Saga: New Moon earned big bucks too. Even small towns warmed up to dubbed Hollywood films. It was a bad, bad year for Kollywood superstars Vikram, Vishal and Suriya in T-Town. Their dubbed Mallanna (Vikram), Pista (Vishal) and Ghatikudu (Suriya) collectively lost Rs 30 crore. The charismatic Allu Arjun tried something new when he essayed a grey role in Arya 2 (the film raked in Rs 15 crore in the first weekend alone). Six-packer Prabhas’ Ek Niranjan earned Rs 12 crore as opening week collections. Star son Nag Chaitanya’s launchpad Josh also posted good openings and the youngster is now doing another “different” film with Gautham Menon. Allari Naresh bounced back with a laugh-riot (Bendu Apparao) while Manchu Manoj tasted moderate success with Prayanam. Siddharth had a hit in Konchem Ishtam Konchem Kashtam and a dud in Oye, while Varun Sandesh had a disappointing Evariana Eppudaina and Kurradu. Nani had a hit in Ride and a flop in Snehithuda, while Tanish scraped through with Ride. T-Town’s biggest stars Mahesh Babu, NTR Junior, Nagarjuna and Pawan Kalyan had no releases this year. Only Venkatesh had a release in Eenadu. Unfortunately the film didn’t work. Among the reigning divas of Tollywood, only Anushka seems to be flying high after Arundhati. The other screen scorchers Ileana (Rechipo), Genelia (Sasireka Parinayam), Nayanthara (Anjaneyulu) and Hansika (Jayeebhava) all had flops to their credit. Upcoming stars Aksha and Swetha Basu tasted success with Ride and Harika too had a Prayanam to her credit. Kangna Ranaut’s Rs 1 crore dream debut with Ek Niranjan made her the most expensive debutante in Tollyland, but the film was a commercial letdown. Summing up the scenario, thespian Ramanaidu who bounced back with Bendu Apparao says, “For decades the success ratio has always wavered between 10 per cent to 20 per cent, but this year things have been bad. I hope things improve next year,” he adds. With spiralling cost of production as stars and directors continue to take home hefty pay cheques, paucity of ‘novel scripts’, here’s hoping for some more miracles in Tollywood in 2010. Perhaps the best is yet to come. 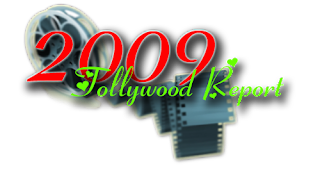 0 Response to "Tollywood's Report card of 2009"